Jumping in line with the other real-time card brands, Leaf Live trading cards enter the print-to-order fray with their own take on timely card releases. 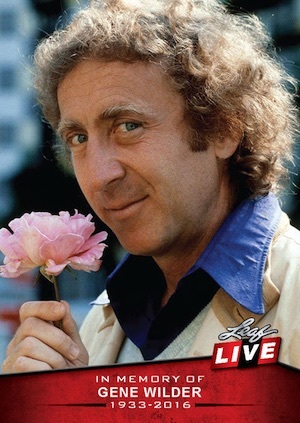 Starting in 2016, the new set debuts with a cardboard tribute to beloved actor Gene Wilder. Featuring a common format, each Leaf Live card is sold for one full week (or longer) and the total amount produced will directly reflect the number ordered. As stated by the card maker, "Whether the print run is 10 copies or 500, Leaf pledges to let the marketplace determine the print run of its special offerings." Although many of the other real-time sets have a specific focus, Leaf Live trading cards touch on a wide array of genres, including sports, entertainment and politics, among other topics deemed relevant by the company. 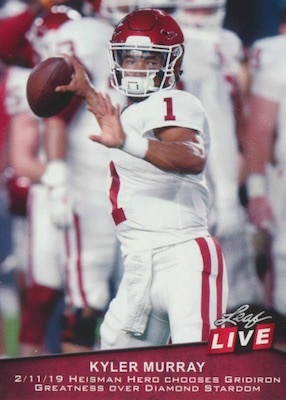 Leaf Live cards are directly sold through the Leaf eBay account and priced at $3.99 each. Economy shipping tacks on another $2.99. There has been no real consistency for the Leaf Live trading cards over the years, with most releasing in 2016. This guide will be updated as new cards are announced. Print runs (PR) added when known. Buy previous cards on eBay.